It’s hard to answer the question `Where is your family from?’. People move, which part of the family are we talking about?, and how far back do you want to go? 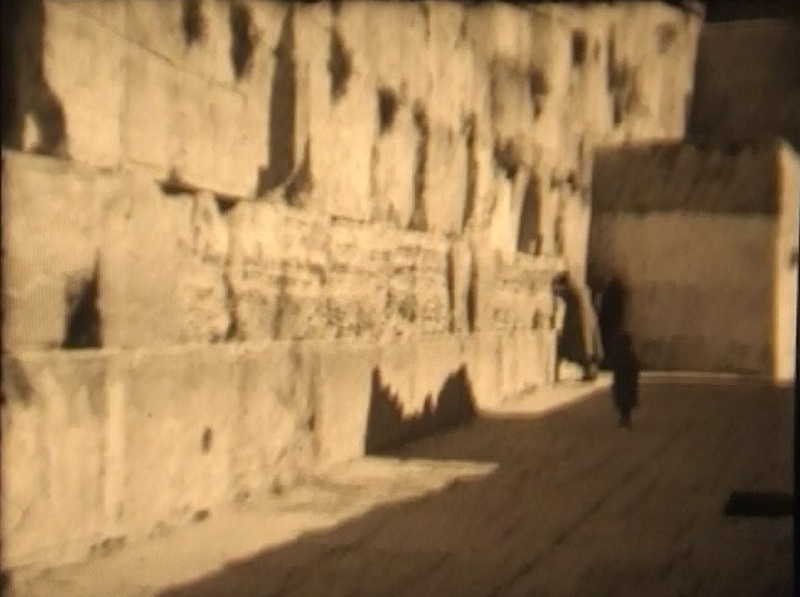 However, one line of my descent that goes back a long way very definitely has had an enduring association with a particular place for many centuries. The place is Whitmore, a Staffordshire manor. Where am I from? I can say that my family is from Whitmore. A watercolour painting of Whitmore Hall which was probably owned by Kathleen Cudmore nee Cavenagh-Mainwaring, my great grandmother. My father now has the picture. My paternal grandmother’s mother’s side of the family have lived at Whitmore for nearly a thousand years. The estate has remained in the family since the Domesday Book was compiled in 1086, in the reign of William the Conqueror. The inheritance has sometimes passed through the female line, most recently to my great great grandmother Ellen Cavenagh nee Mainwaring (1845 – 1920). My father’s first cousin is now the 34th Hereditary Lord of Whitmore. Thirty-four generations have inherited Whitmore since a Saxon called Ulfac owned Whitmore and was usurped after the Battle of Hastings by a Norman knight who had supported William. by the year from the shire? Whitmore is the second entry of Staffordshire page 10. The tenant in chief was Richard the forester. Total tax assessed: 0.5 geld units (dry small). Households: 3 villagers. 2 smallholders. Ploughland: 3 ploughlands (land for). 1 lord’s plough teams. 1 men’s plough teams. Other resources: Meadow 1 acres. Woodland 1 * 0.5 leagues. Lord in 1066: Ulfac or alternatively spelt Wulfheah. Lord in 1086: Nigel (of Stafford). Tenant-in-chief in 1086: Richard the forester. The name Richard the forester, the tenant in chief was associated with no places before the Conquest and 21 after the Conquest. There may have been more than one man who bore that title but all the places associated with the name are either in Staffordshire or neighbouring Warwickshire. In 1212 during the reign of King John there was a Great Inquest of Service. Randolph de Knutton held Whitmore with other land and paid £4. 11s. 6d. of “antient right”, that is, from the Conquest of England. It is thought that Ralph de Knutton was the lineal heir or co-heir of Richard the forester. My much read copy of “The Mainwarings of Whitmore and Biddulph in the County of Stafford. An account of the family, and its connections by marriage and descent; with special reference to the Manor of Whitmore. ” This copy had been owned by my grandmother. 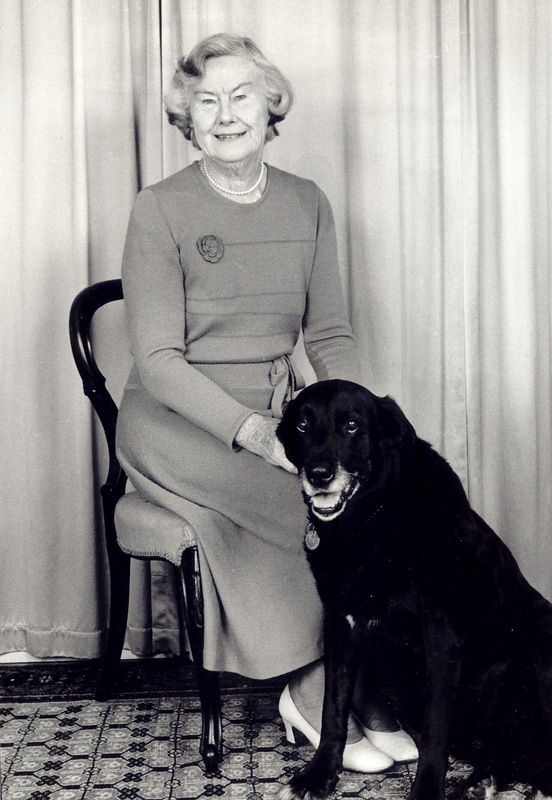 The book was written by her uncle James Gordon Cavenagh-Mainwaring and published about 1935. I look forward to visiting Whitmore again in May and seeing my cousins there. 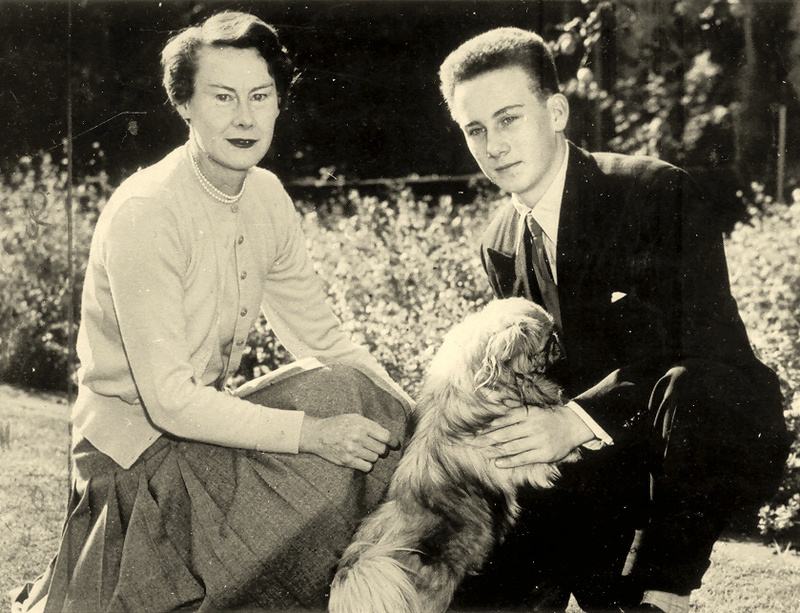 Cavenagh-Mainwaring, Christine and Britton, Heather, (editor.) Whitmore Hall : from 1066 to Waltzing Matilda. 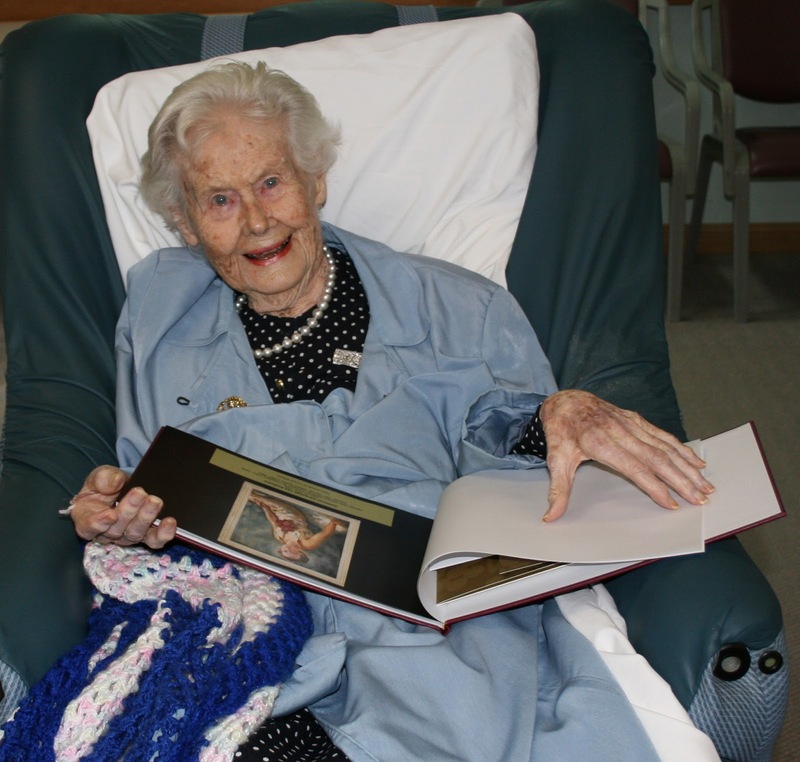 Adelaide Peacock Publications, 2013. 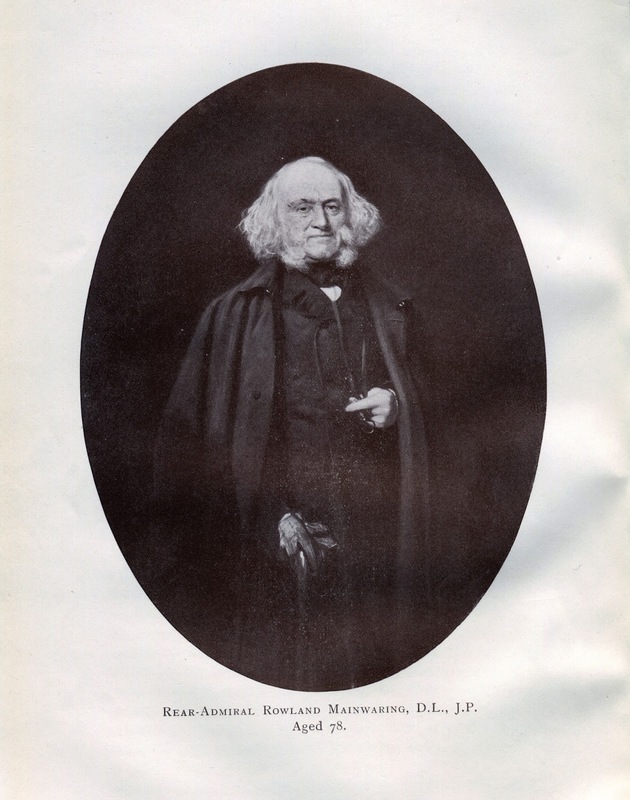 Rowland Mainwaring (1783 – 1862) was my fourth great grandfather. 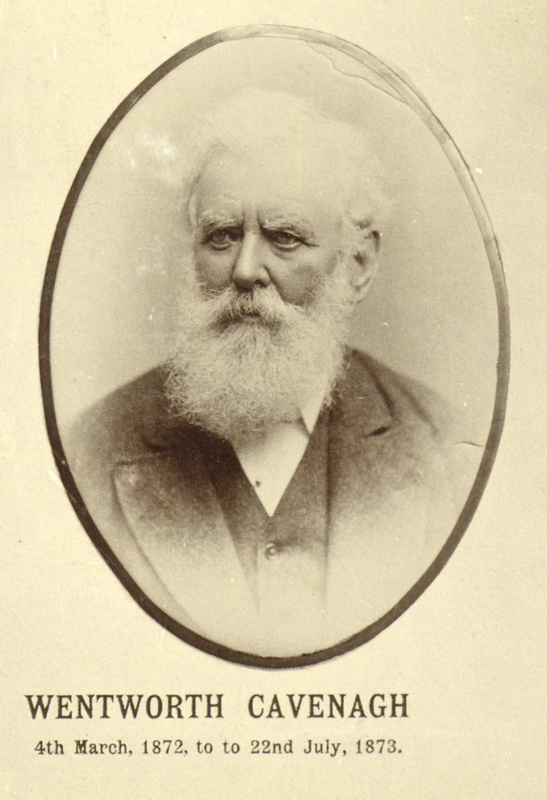 In 1840 his son Gordon (1817 – 1872) was sent from England to live in Australia. Rowland Mainwaring in 1861 from The Mainwarings of Whitmore and Biddulph in the County of Stafford. An account of the family, and its connections by marriage and descent; with special reference to the Manor of Whitmore. J.G. 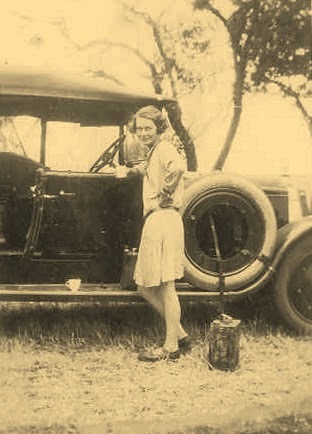 Cavenagh-Mainwaring, about 1935. 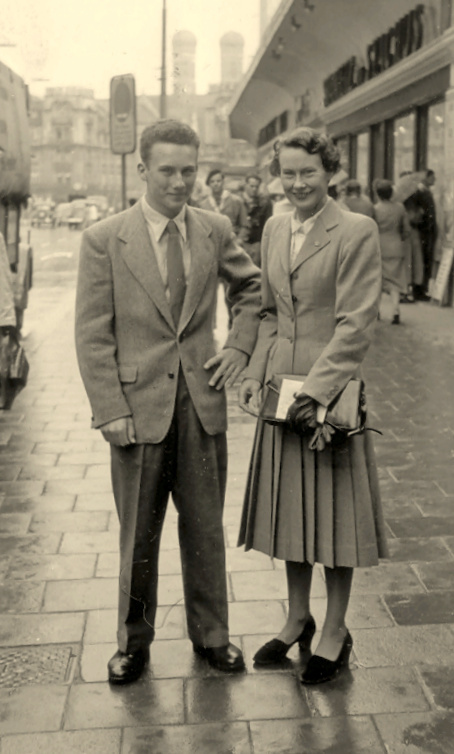 Gordon was the third son, not expected to inherit the estate. Gordon Mainwaring had a problem with alcohol. He drank too much, and after a time in the army in India arrived in South Australia in January 1840, banished there by his family, who paid for him to stay away. He is known in the family as the remittance man. This term meant an emigrant, often sent to a British colony, supported or assisted by payments of money from his family. 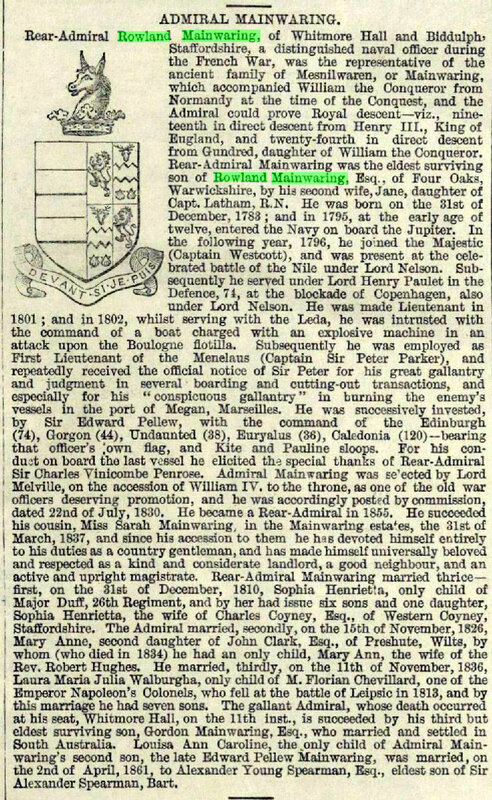 The South Australian Register of 17 June 1862 reproduced a lengthy obituary of Gordon’s father, Admiral Rowland Mainwaring, first published in the Illustrated London News on 26 April 1862. Gordon’s older brothers had died and Gordon, to everyone’s surprise, perhaps including his own, was now the heir to the Whitmore estate. 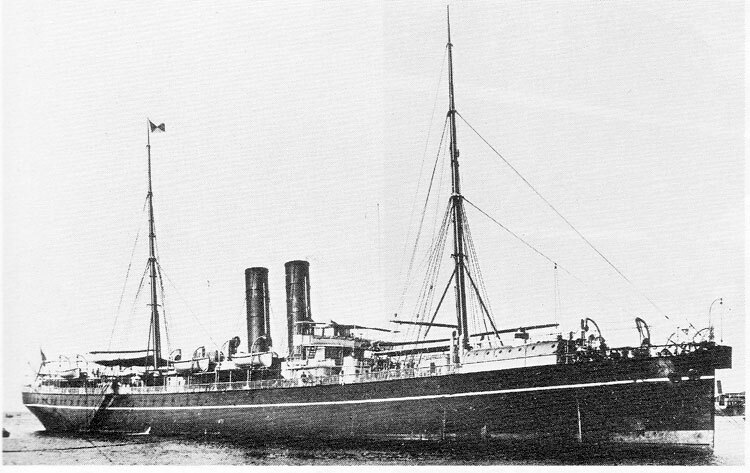 After my great great grandmother Ellen Jane Cavenagh-Mainwaring, formerly Cavenagh, née Mainwaring, inherited the family property of Whitmore in Staffordshire in 1891, the Cavenagh-Mainwaring family sailed for England in 1892 on the SS Ballaarat to take possession of the inheritance. 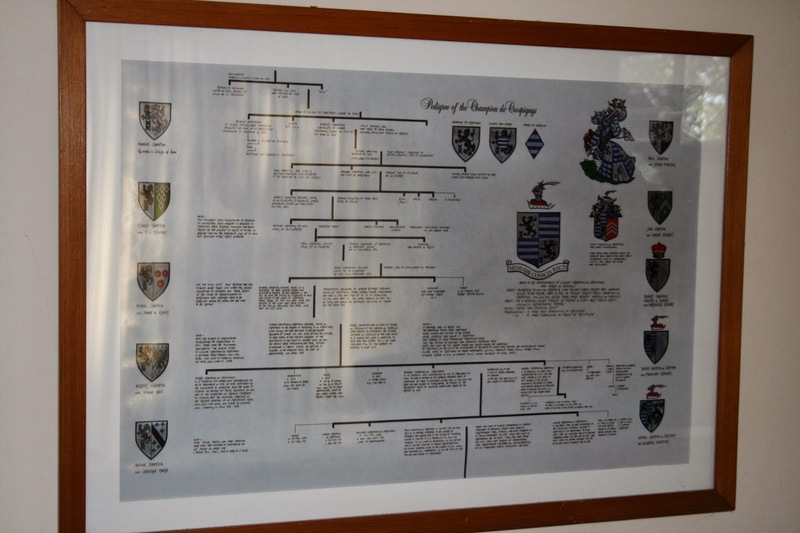 The family surname had been changed in 1891 to assume the name and arms of Mainwaring in addition to Cavenagh in acknowledgement of the inheritance. 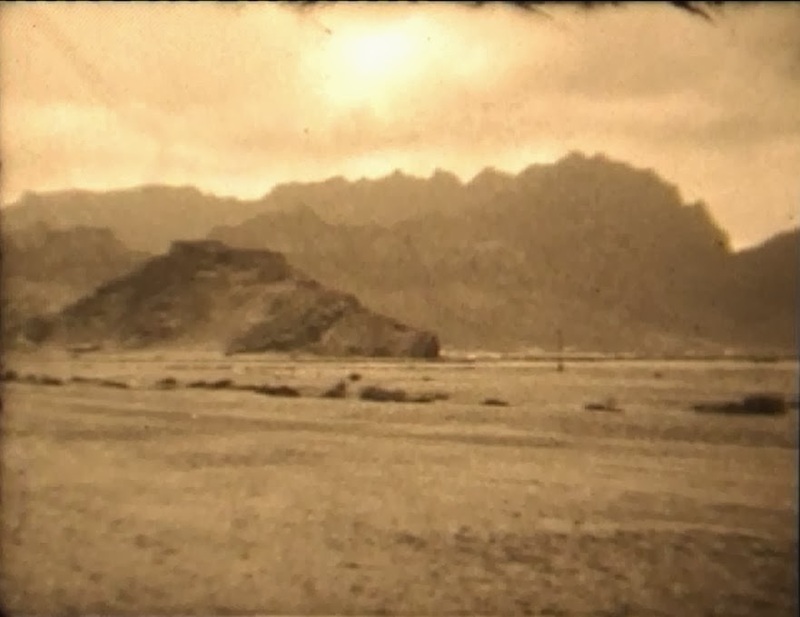 Of the nine surviving children, the six daughters and the youngest son, Hugh, travelled with their parents. 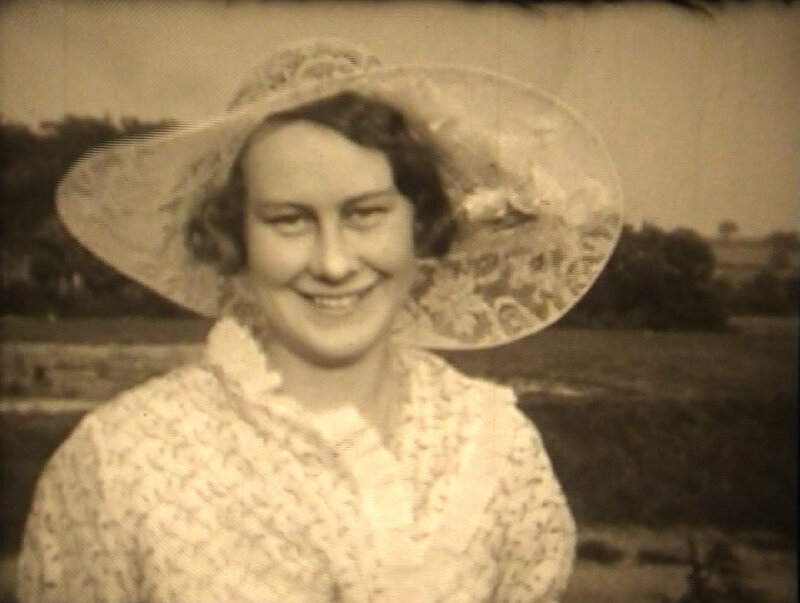 The oldest daughter, Eva, was 24. 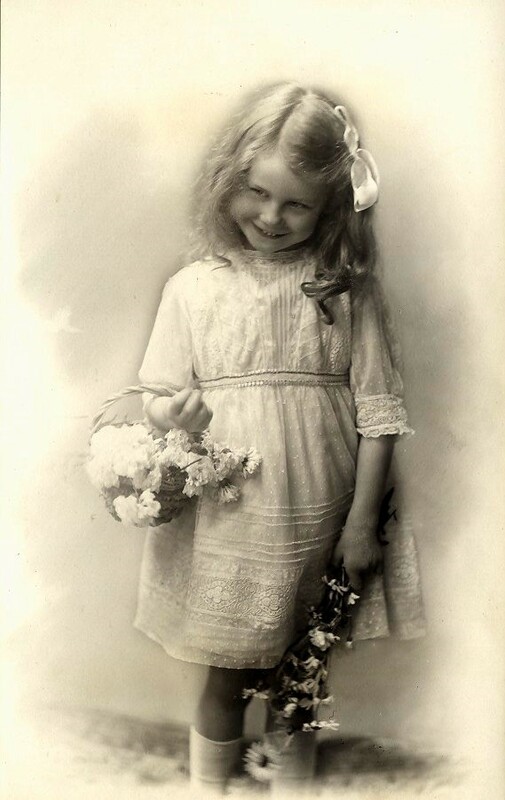 The youngest, Gertrude, known as Kiddie, was 10. 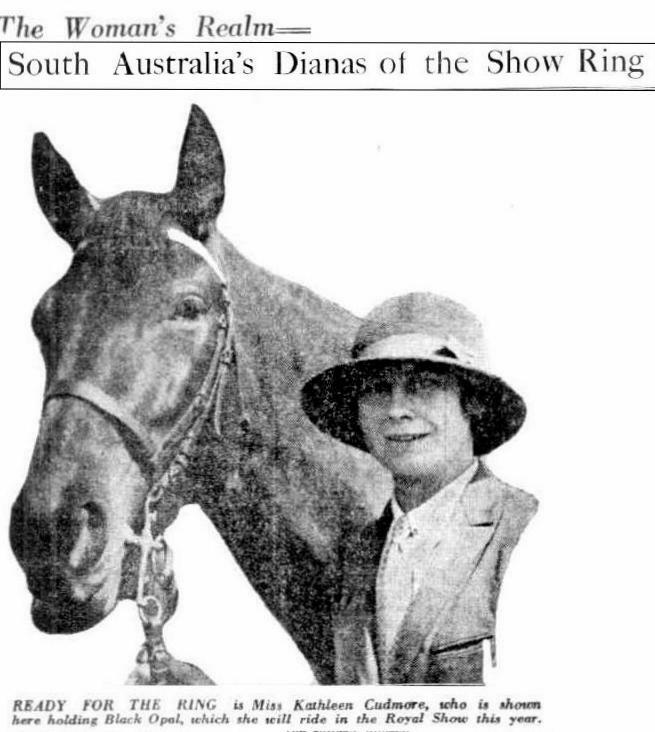 The Ballaarat arrived in London on 8 June 1892. 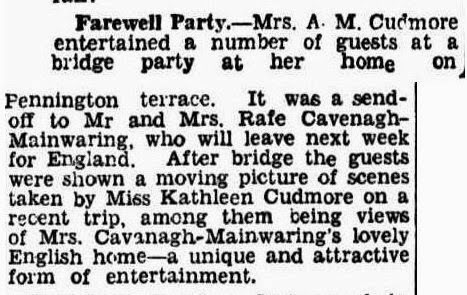 Mr and Mrs Cavenagh-Mainwaring and their children were on the passenger list. The ages on the list are mostly wrong. from Board of Trade: Commercial and Statistical Department and successors: Inwards Passenger Lists. Kew, Surrey, England: The National Archives of the UK (TNA). Series BT26. Class: BT26; Piece: 32; Item: 17 Month: 06. Retrieved through ancestry.com.au. Wentworth Cavenagh-Mainwaring was born in 1822. On arrival he was 69 not 43 as stated. His wife, born in 1845, was 46 not 39. 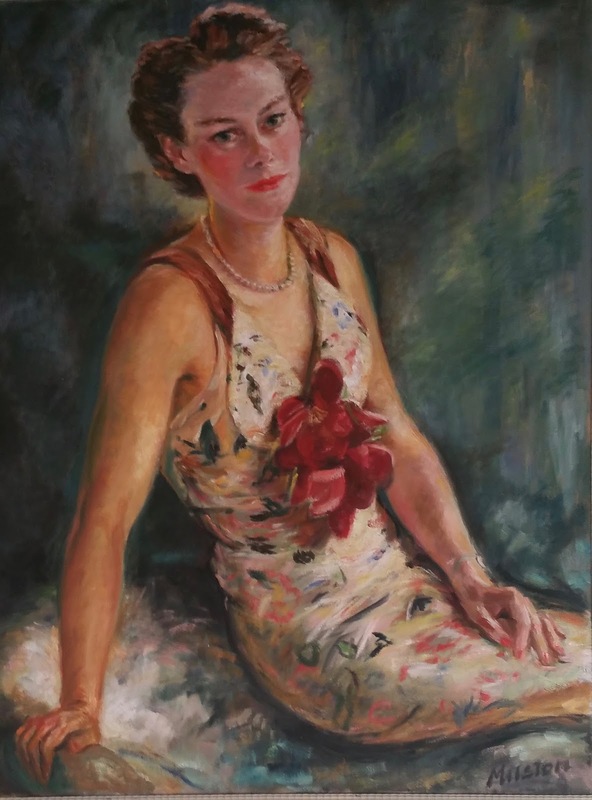 Eva was 24 not 19. May (Mabel) was 23 not 15. Kathleen, my great grandmother, was 18 not 14. 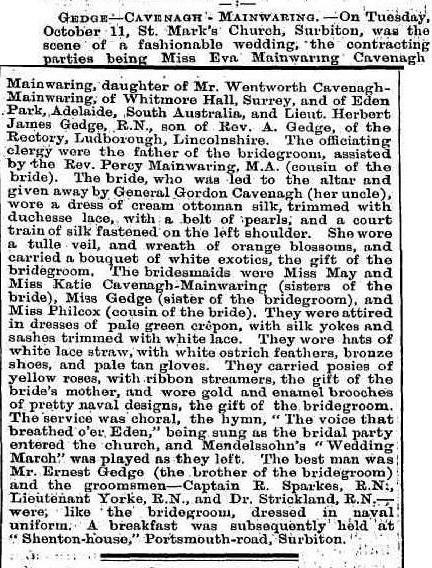 On 4 October 1892 the eldest Cavenagh-Mainwaring daughter, Eva, married Herbert James Gedge, a naval officer. The wedding was reported in Australian newspapers, including the Adelaide Advertiser of 7 November 1892, the South Australian Chronicle of 12 November 1892, and 26 November 1892, the Melbourne Punch of 17 November 1892, the Adelaide Express and Telegraph of 19 November 1892, Melbourne’s Table Talk of 25 November 1892, and the Sydney Mail and New South Wales Advertiser of 10 December 1892. Herbert James Gedge (1859-1913), the son of a clergyman, entered the navy at the age of 12. 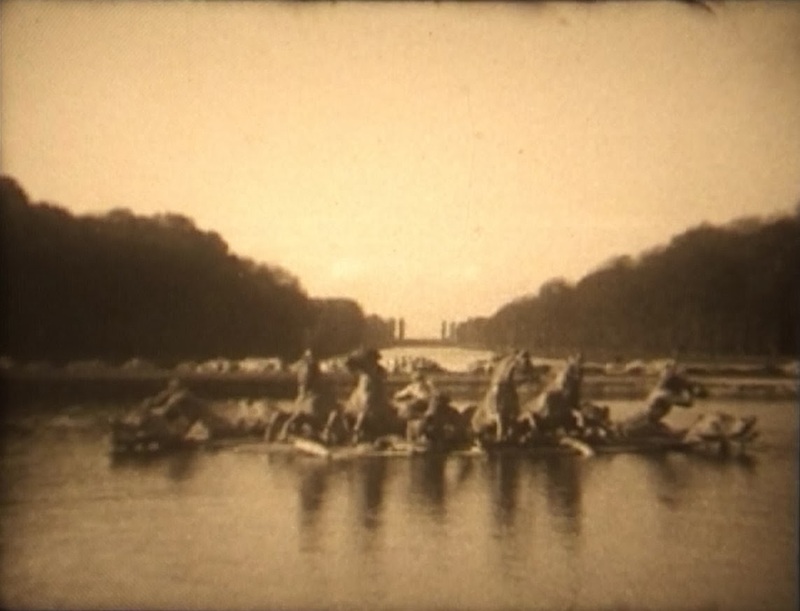 He graduated from the Royal Naval College in 1879. On 15 February 1882 Gedge was promoted to Lieutenant. In the mid 1880s Gedge was posted to the Australia Station, the British naval command responsible for waters around the Australian colonies. The Sydney Mail and New South Wales Advertiser in their report of the 1892 wedding mentioned that Lieutenant Gedge had been on the Australian Station for five or six years, serving as Lieutenant of HMS Nelson and Dart. 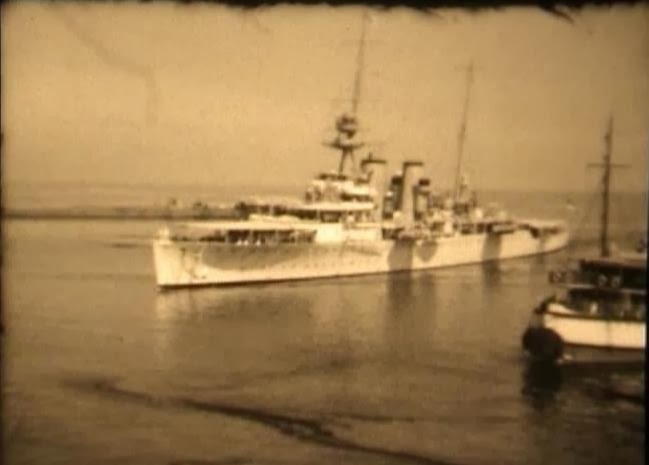 I think for most of his posting Lieutenant Gedge was stationed in Sydney. I checked the passenger list of the Ballaarat for his name. He was a passenger from Sydney together with five other Lieutenants in the Royal Navy, two naval doctors, and two other naval officers. 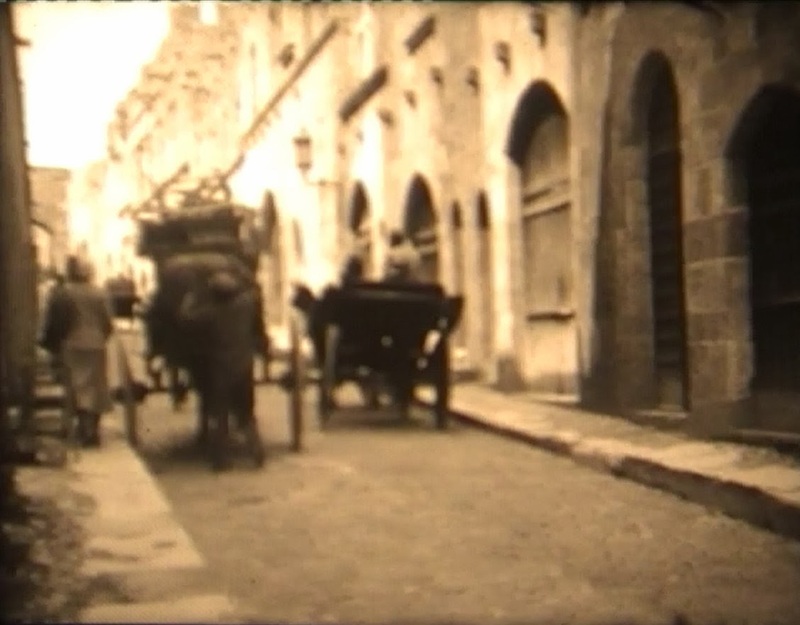 I assume Herbert Gedge and Eva Cavenagh-Mainwaring met aboard the Ballaarat on the trip to England in 1892. I have found no evidence their paths crossed earlier. Browsing the National Library of Australia’s ‘Trove’ digitised newspaper collection recently, I came across a shipping departure notice which gives a succinct family history of my Cavenagh and Mainwaring great great and great great great grandparents. 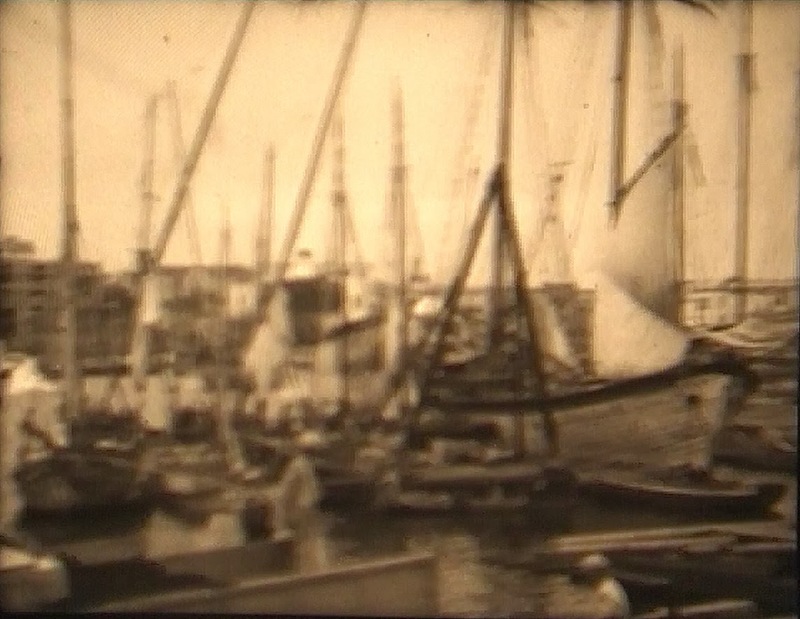 The Cavenagh-Mainwaring family were about to sail for England on the Ballaarat. Lots of information to follow up and facts to check. Until I came across this information I did not know that James Gordon Cavenagh, my great great great grandfather, an army surgeon with the Royal Staff Corps, was at Waterloo. He is listed on page 20 in the list of officers as a surgeon in the Royal Staff Corps in John Booth’s 1816 book of The Battle of Waterloo. He is also listed in The Bloody Fields of Waterloo: Medical Support at Wellington’s Greatest Battle by Michael Crumplin published in 2013. I also didn’t know very much about his son, my great great grandfather, Wentworth Cavenagh. It appears that he was educated at Ferns Diocesan School in Wexford, Ireland. 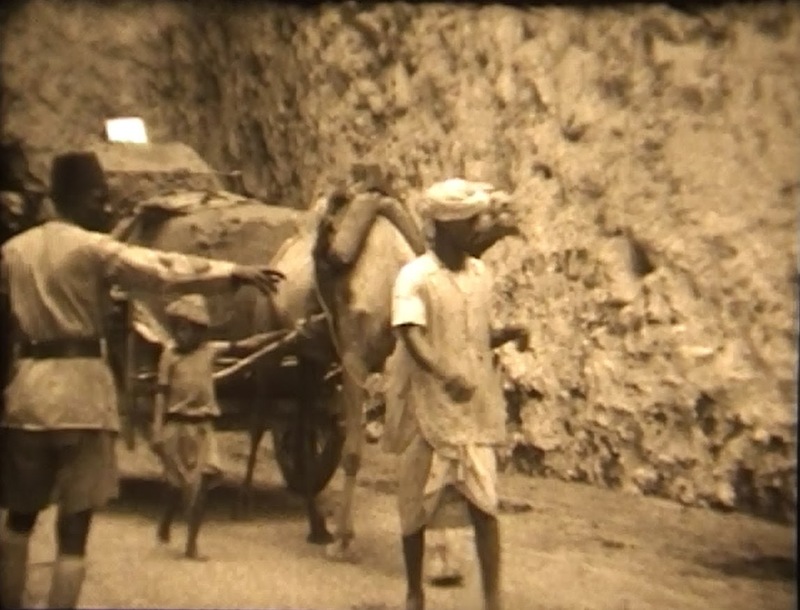 When he was 18 years old he went to Canada, Ceylon, and Calcutta and from there to the Bendigo diggings. 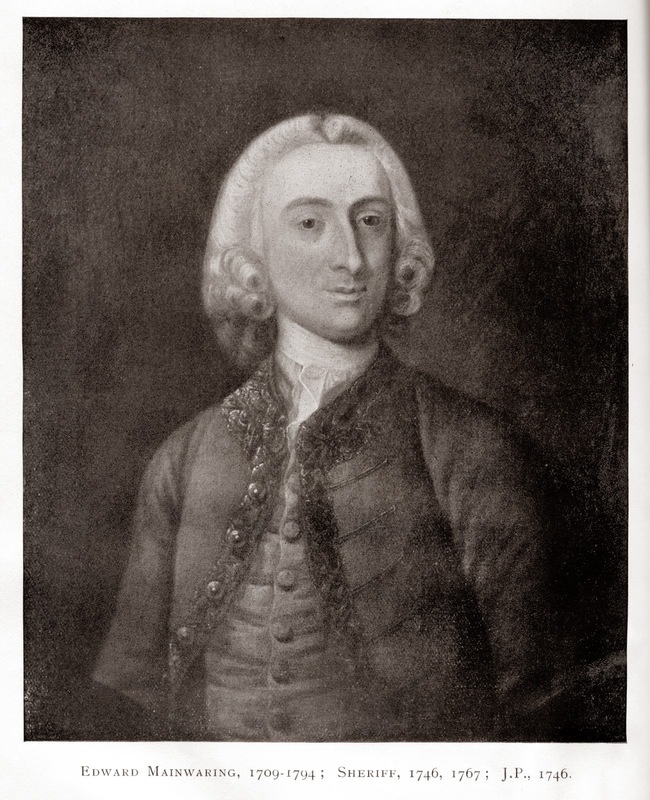 My sixth great grandfather was Edward Mainwaring (1709-1795), who lived at Whitmore in Staffordshire. Edward Mainwaring is mentioned in A Genealogical and Heraldic History of the Commoners of Great Britain and Ireland, Enjoying Territorial Possessions Or High Official Rank: But Uninvested with Heritable Honours, Volume 3, 1836 by John Burke republished as an ebook by Google at http://books.google.com.au/books?id=qf4GAAAAQAAJ. The invasion of Charles Edward in 1745 is better known today as the Jacobite rising of 1745, or “The ‘Forty-Five”. It was the attempt by Charles Edward Stuart (1720-1788), the Young Pretender or Bonnie Prince Charlie, to regain the British throne for the exiled House of Stuart. The history to which Gordon refers is probably John Ward History of the Borough of Stoke on Trent, Simpkin Marshall, London, 1838. There was also an edition published in 1843. The Jacobites entered England on 8 November. They besieged Carlisle for two days until they surrendered on 15 November. On 23 November the defence of Manchester was abandoned. The Jacobites reached Derby on 4 December. Derby is over 170 miles south from the Scottish border and less than 40 miles east of Whitmore. More importantly Derby is only 127 miles from London. From Derby the Jacobites retreated. It was probably not due to Mainwaring’s intervention. Prince Charles and his advisors decided to return to Scotland because of rumours that they were about to face a huge Government army.The Jacobites had good reason to be afraid of an English offensive. Carlisle was besieged from 21 to 30 December and the Jacobites lost control of the city. The Jacobites were finally defeatedby the Duke of Cumberland, the son of George II, at the Battle of Culloden on 16 April 1746. I don’t know if Edward Mainwaring fought against the Jacobites after their retreat from Derby. 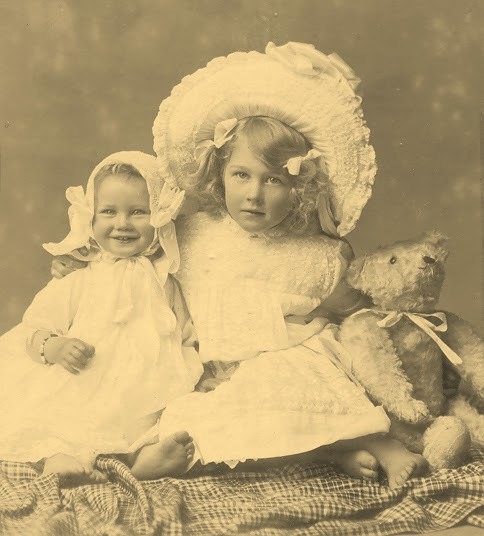 LIn the fifth week of Shauna Hicks’s series of blog posts about genealogical records the topic is family stories. 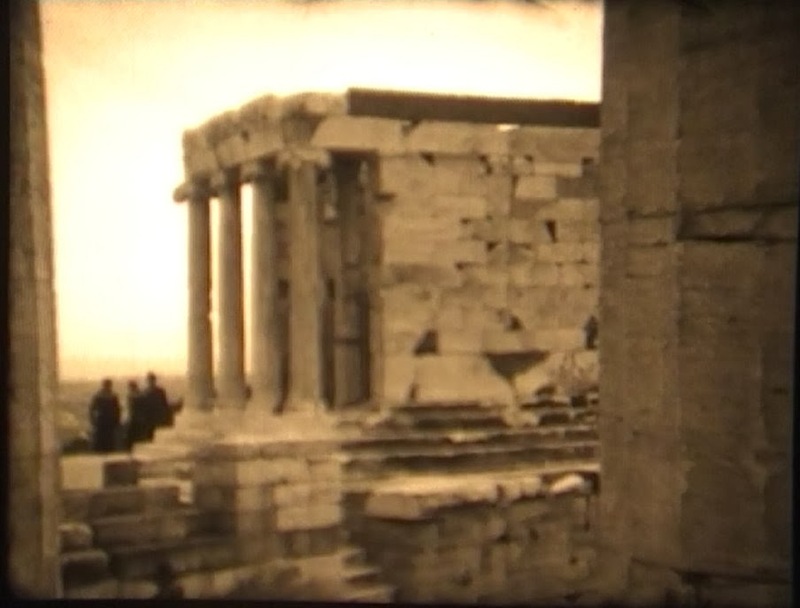 Before we had computer databases, family history was largely passed down by stories. 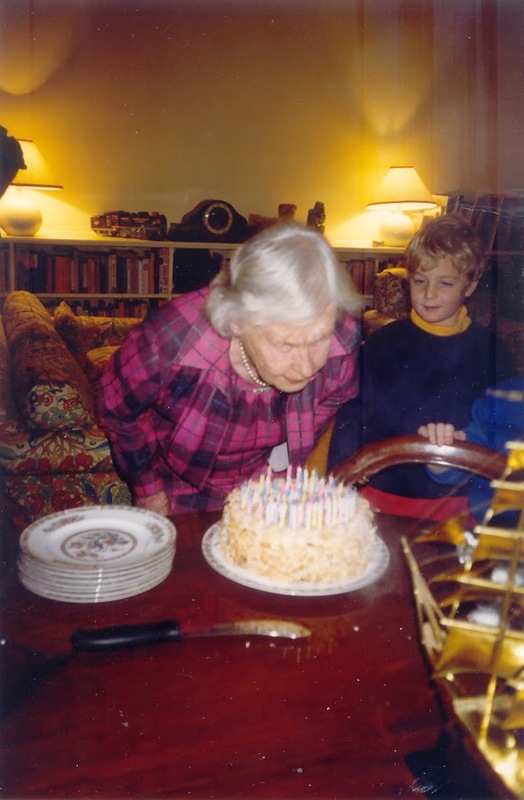 For example, my mother-in-law had a very clear idea of who her forebears were for several generations and was able to give brief outlines of their lives for ancestors back to the early nineteenth century from the top of her head. I have been able to verify the family history with records, and what she set out for me from memory was remarkably accurate. On my side of the family, several relations have written family history books thereby preserving many family stories. My third cousin twice removed, Stephen de Crespigny, has gathered an enormous amount of family history. He collected information, documents and stories, but also had drawn up a comprehensive family tree in the early 1990s. My great great great grandfather Philip Chauncy wrote memoirs of his sister and his second wife. These were republished in 1976. (Chauncy, Philip Lamothe Snell Memoirs of Mrs Poole and Mrs Chauncy. Lowden, Kilmore, Vic, 1976.) The State Library of Victoria also holds a manuscript of his journal of his trip to Australia and other family history and biographical notes he made. My Great grand uncle James Gordon Cavenagh-Mainwaring (1865 – 1938) wrote a history of the Mainwaring family back to the entry of Whitmore estate in the Domesday Book of 1068. (Cavenagh-Mainwaring, James Gordon The Mainwarings of Whitmore and Biddulph in the County of Stafford. An account of the family, and its connections by marriage and descent; with special reference to the Manor of Whitmore. J.G. 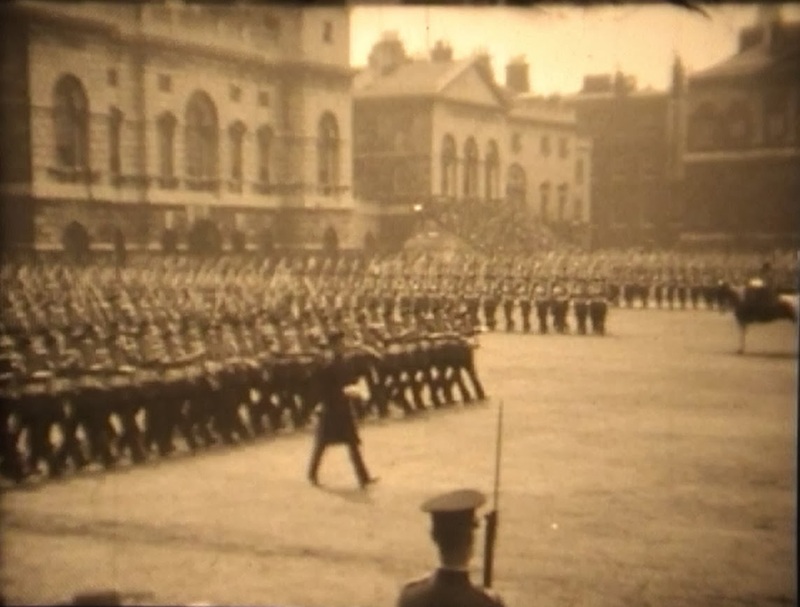 Cavenagh-Mainwaring, about 1935.) The estate of Whitmore where my cousins now live has never been sold since the entry in the Domesday book but always been transferred through inheritance, albeit sometimes through the female line. More recently the wife of my father’s cousin, Christine Cavenagh-Mainwaring, has produced an updated history of Whitmore and the family. (Cavenagh-Mainwaring, Christine and Britton, Heather, (editor.) 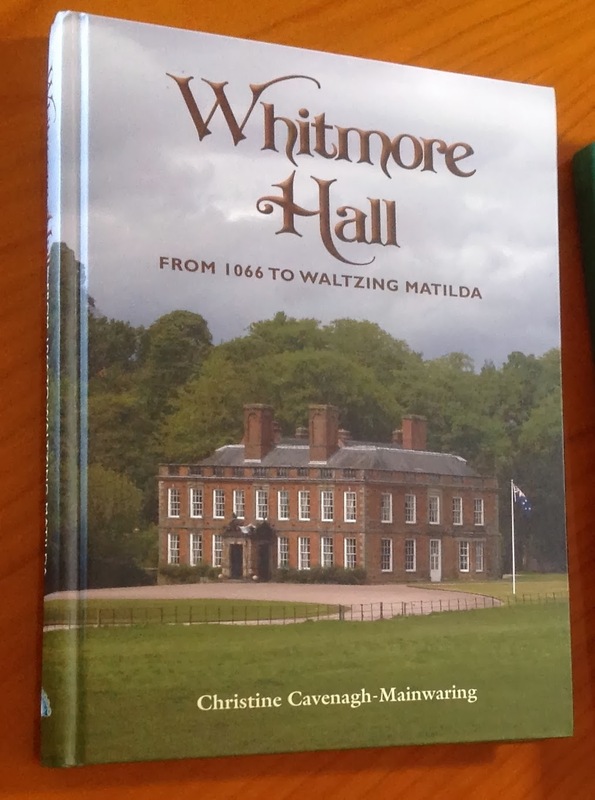 Whitmore Hall : from 1066 to Waltzing Matilda. Adelaide Peacock Publications, 2013. ) 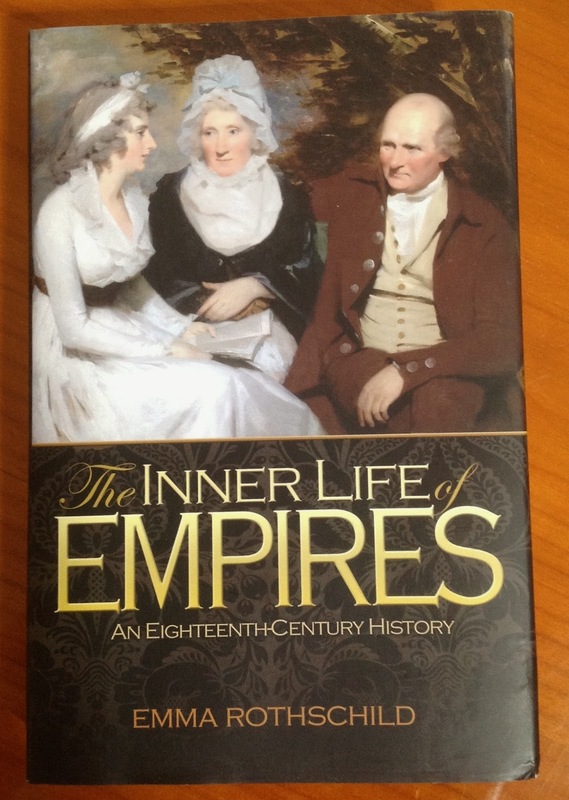 I was very pleased to be given a copy of the book by Guy and Christine when I saw them in Adelaide last month. 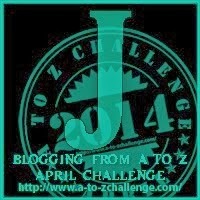 Christine provides an update on what happened to Gerald Mainwaring (1854 – ?) though she also has not been able to trace what happened to him eventually. My blog entry deals with him being tried for murder but he was not hanged as the jury effectively cast a ballot to decide his fate. His sentence was commuted to penal servitude. Apparently he was released on licence on May 16, 1894. 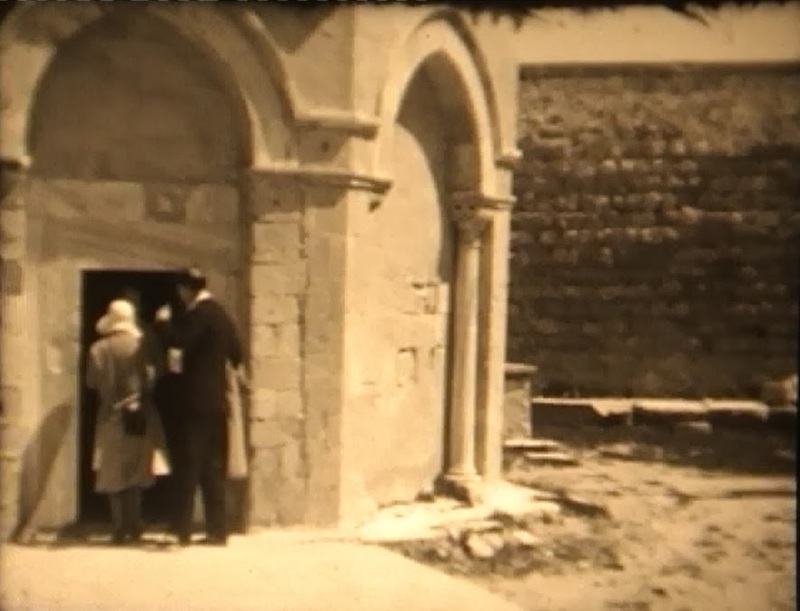 The family story is that Gerald made his way to Whitmore where his brother Percy (1857 – 1927), the Rector of Whitmore, would not let him into the house, gave him a five pound note and an overcoat and sent him away. Perhaps Gerald changed his name and returned to Canada. There seems no record of him after that time. 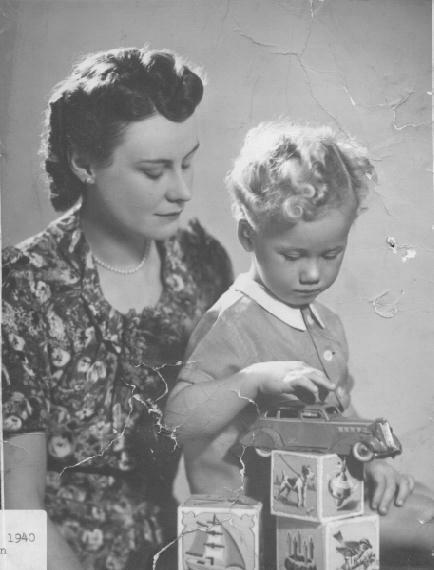 There are lots of other family stories in Christine’s book to follow up on and to research further. 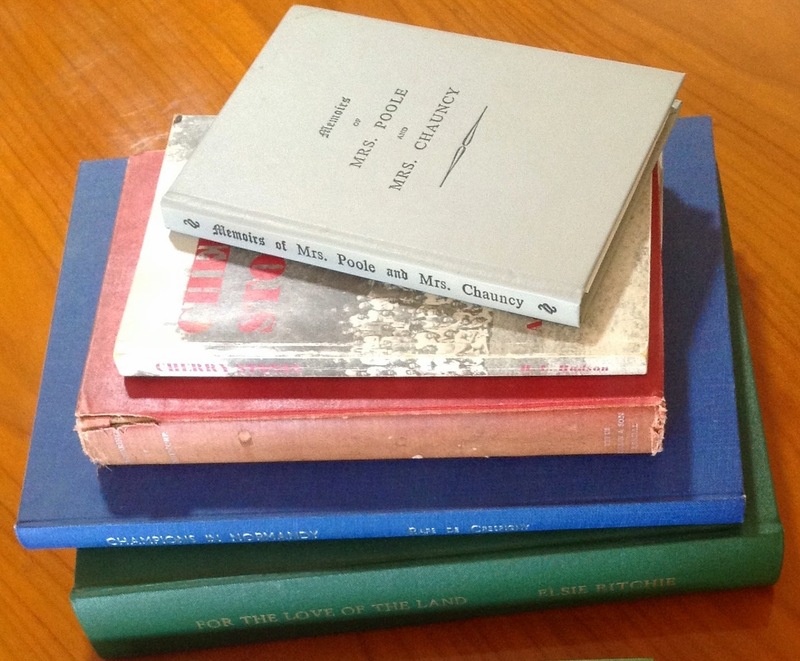 A collection of family history books. 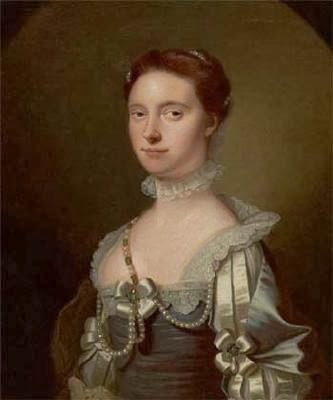 Among other stories, I learned from the book that in 1759 Barbara separated from her husband Charles Kinnaird (1723 – 1767). He had succeeded to the barony in the peerage of Scotland as 6th Lord Kinnaird in 1758. Barbara awarded £130 per year and £100 pounds for furniture. She did not have access to her children. Her husband stated she had committed no crime other than ill nature. It is a bit intimidating when so much family history has been written to attempt one’s own study. However, I have found plenty more family history to research while enjoying the stories published by others. 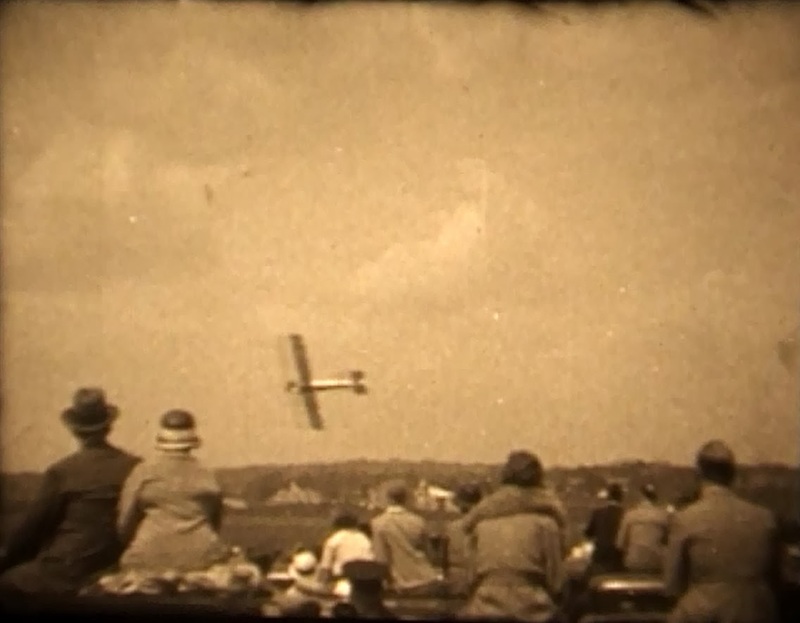 We still have those home movies and I remember being shown them by my grandmother, Kathleen. My brother has had them copied to DVD. 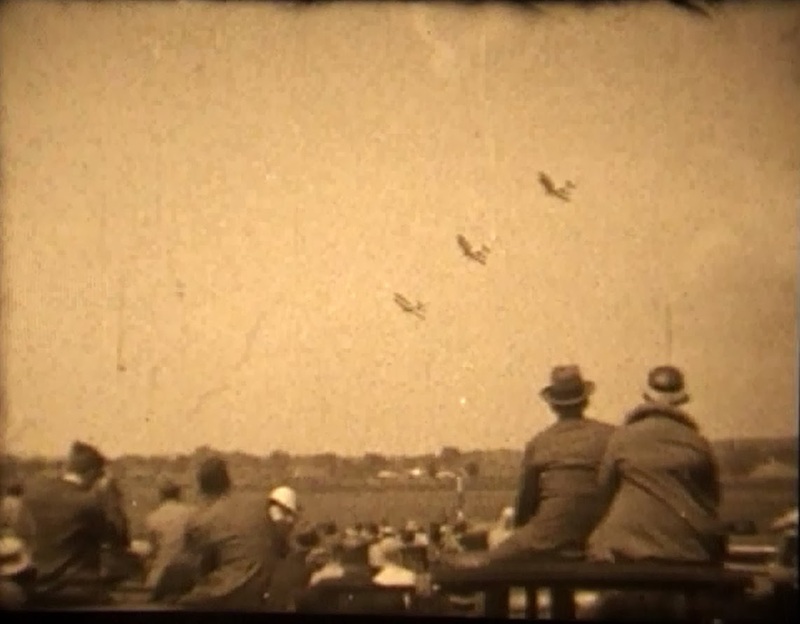 The film of Hendon Air Show I found particularly fascinating. 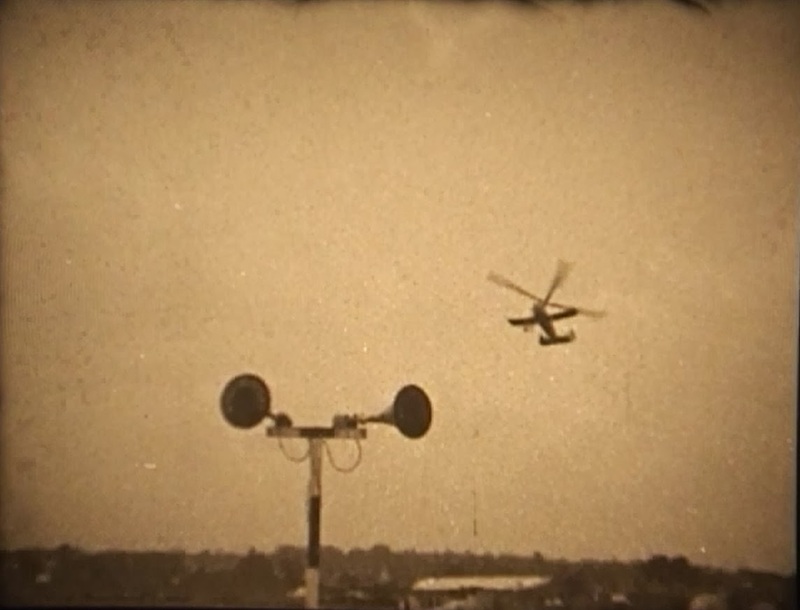 Hendon Air Show – gyrocopter? 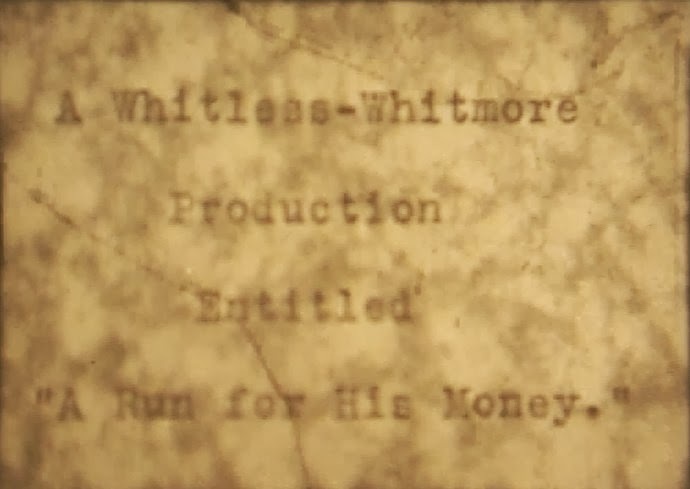 The pictures of Whitmore would seem to be those that were the backdrop for a comedy film called “A Run for his Money”. 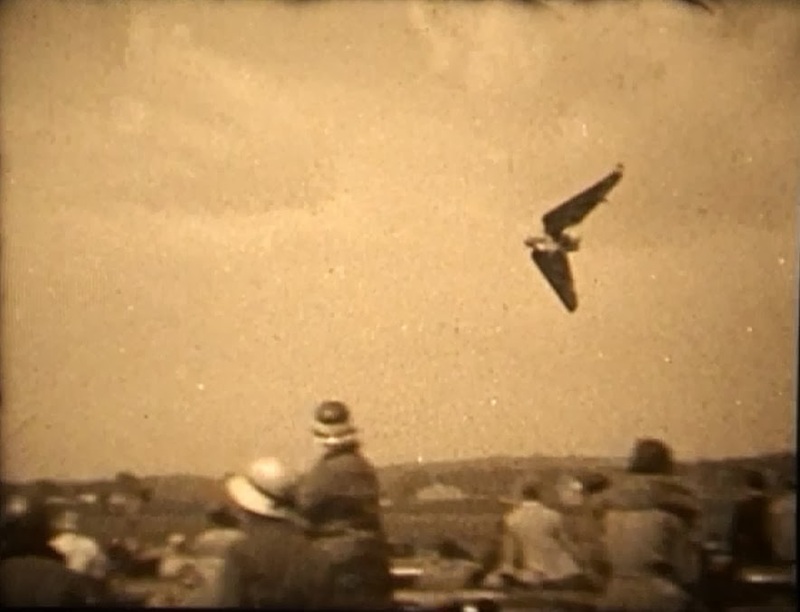 Unfortunately I am not able to capture any meaningful stills of Whitmore – the village and lake featured in the film as well as the grounds of Whitmore. Gerald Mainwaring born about 1854 was the sixth of ten children of the Reverend Charles Henry Mainwaring (1819 – 1878) and his wife Jane née Delves-Broughton (1824 – 1873). Charles Henry and Jane married in 1847. He was the fifth child (fourth son) of Admiral Rowland Mainwaring of Whitmore Hall in Staffordshire (1783 – 1862). Charles Henry had been ordained in 1845 and tool up took up residence at the rectory as curate of Whitmore in 1846. He was inducted as rector of Whitmore in 1868 following the death of the incumbent the Reverend John Brazier. In 1861 Gerald aged 6 was living at Whitmore rectory with his father, nine siblings and a governess, cook, three housemaids and another female servant. His mother was away from home. Ancestry.com. 1861 England Census [database on-line]. Provo, UT, USA: Ancestry.com Operations Inc, 2005. In 1871 Gerald was not at home with his parents and 8 siblings. Also missing from the family home was Cecil. Ancestry.com. 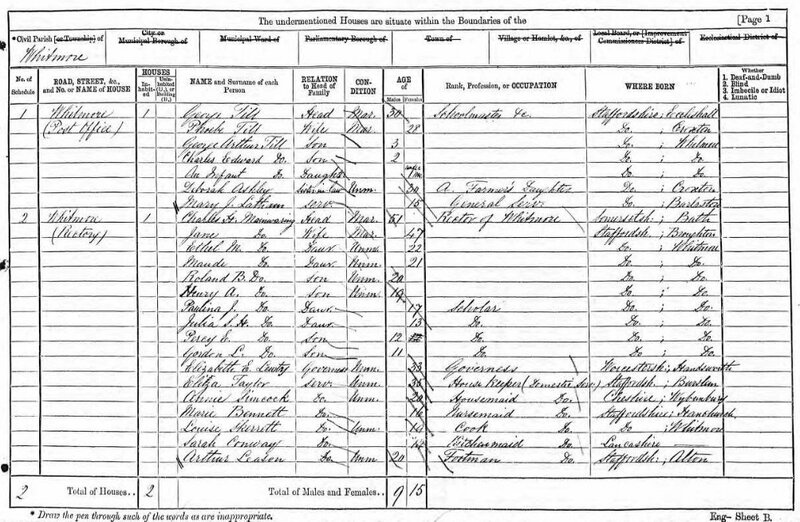 1871 England Census [database on-line]. Provo, UT, USA: Ancestry.com Operations Inc, 2004. 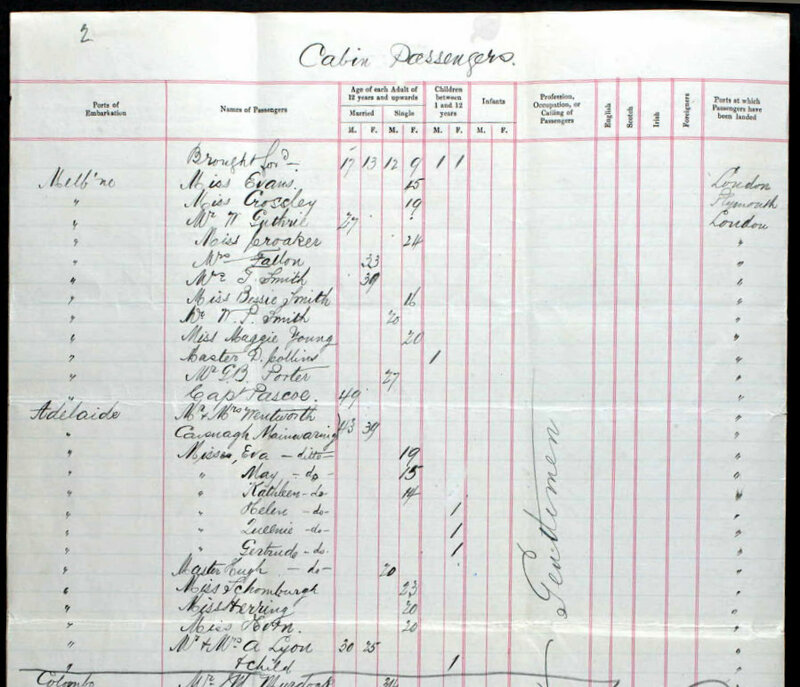 The school could cater for 400 boys and in the 1871 census filled a twenty page enumeration book with pupils and staff members (25 to a page). 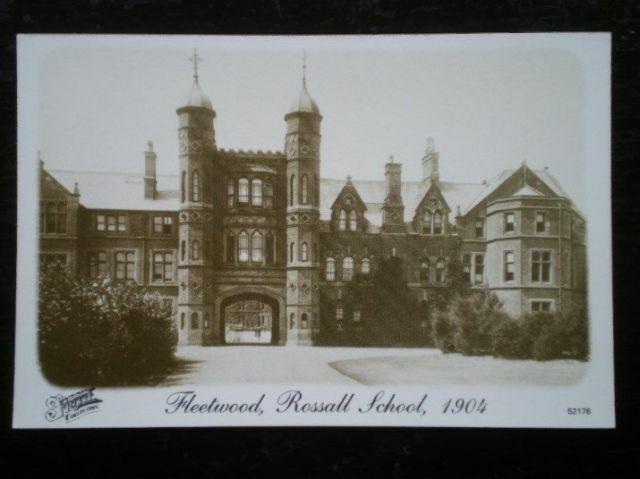 Rossall School in 1904. The archway was built in 1867. As a side note, stone from Rossall can be found in the cloisters of Canberra Grammar School, where my brother, son and nephews went to school, along with stones from Eton, Westminster, St Paul’s, and ten other schools. Gerald’s mother Jane died on 30 June 1873 at the age of 51. Gerald’s father died in 1878 at Whitmore age 58. The oldest daughter Ethel Mary Mainwaring (1848 – 1932) married William Robert Parker-Jervis in 1877. The second daughter Maude Mainwaring (1849 – 1924) in 1881 was visiting her sister Julia and husband. In 1886 Maude married Edward Swynfen Parker Jervis of Little Aston Hall; he was her sister Ethel’s father-in-law, that is the father of William Robert Parker Jervis. The oldest son Rowland Broughton Mainwaring (1850 – 1926) had entered the army in 1871. 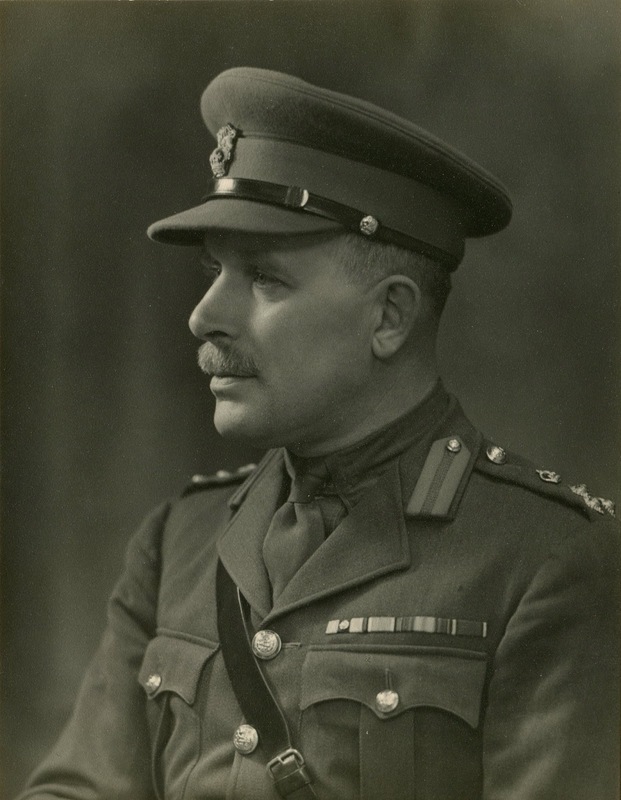 He had a distinguished career and served as a general in World War 1. He married in 1880 but died without issue. In 1873 he was in Africa serving in the Third Ashanti War as a Lieutenant in the 2/23rd Royal Welsh Fusiliers. The second son Henry Arthur Mainwaring (1852 – 1877) died in Cordoba, Argentina aged 25. Cecil Charles Mainwaring (1853 – 1877) died age 24 near Toronto, Canada. His occupation at time of death was a clerk. Administration of the estates of Henry and Cecil was granted to Edward Delves Broughton of Wistaston Hall who was the sole acting executor of the will of their father. 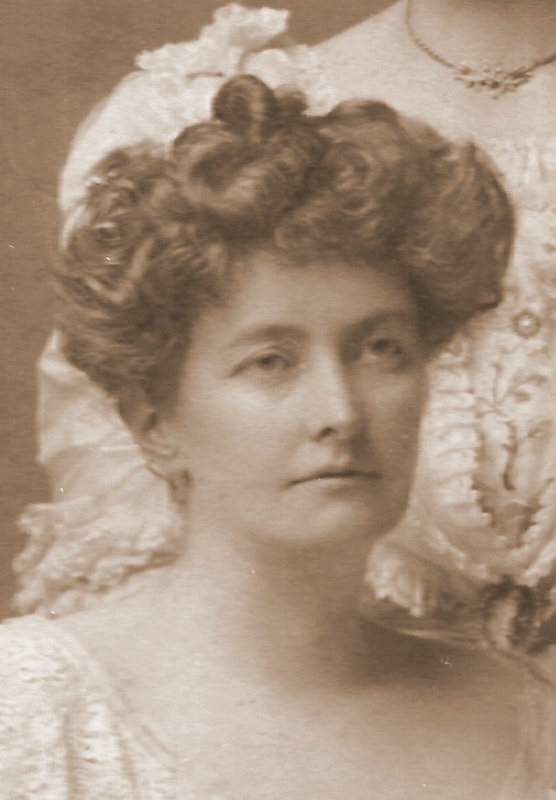 Pauline Jane Mainwaring (1854 – 1909) married Robert Burton in 1891. In 1881 she accompanied her brother Percy on a visit to Angus Obbard and his wife. Obbard was a clergyman living in Sussex. Gerald was tried for murder in 1879 (more on that later). Before 1879 he had been 3 or 4 years in America, one report stated he was successfully farming at Manitoba in Canada. 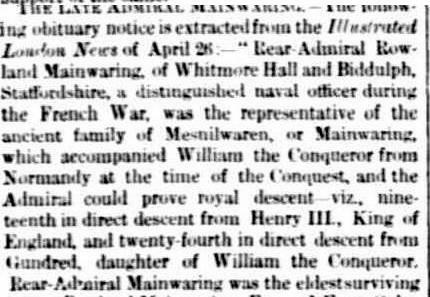 There is a shipping record for 1875 for a Mr Mainwaring sailing to Quebec on the Nova Scotia but there is not enough information to identify him as a member of the family or otherwise. 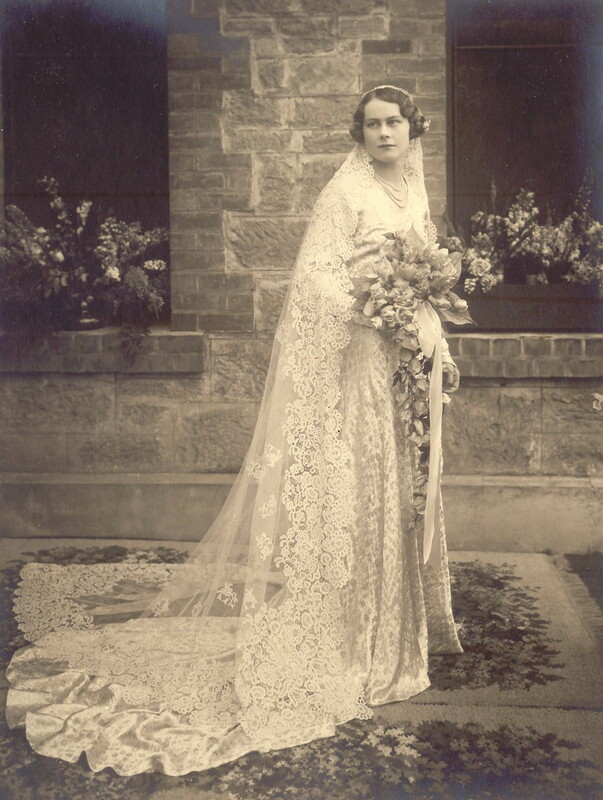 Julia Sophia Henrietta Mainwaring (1857 – 1943) married Walter Neil Jervis at Clifton Derbyshire in April 1879. 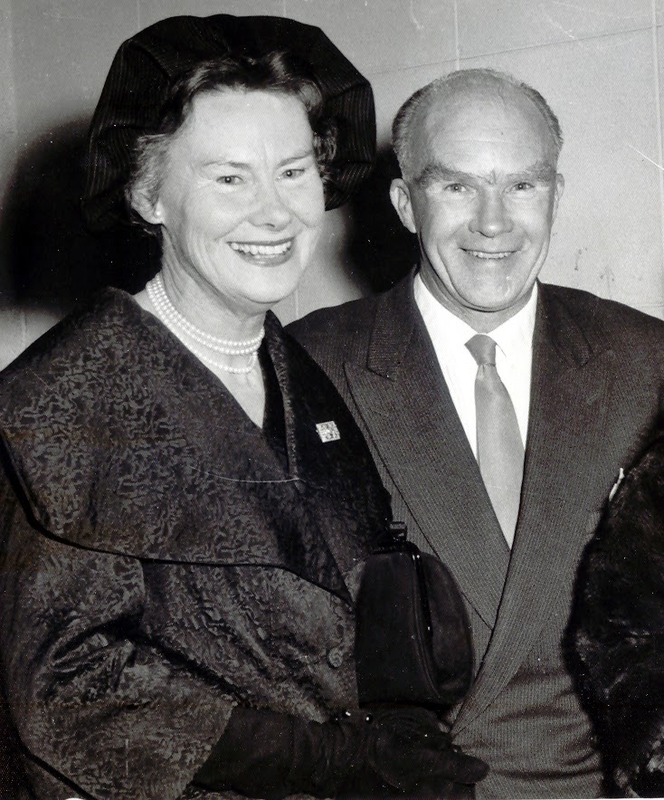 Apparently it was for this wedding that Gerald Mainwaring returned from Canada. The fifth son Percy Edward Mainwaring (1858 – 1927) studied at Pembroke College, Oxford. He became Rector of Whitmore in 1885. 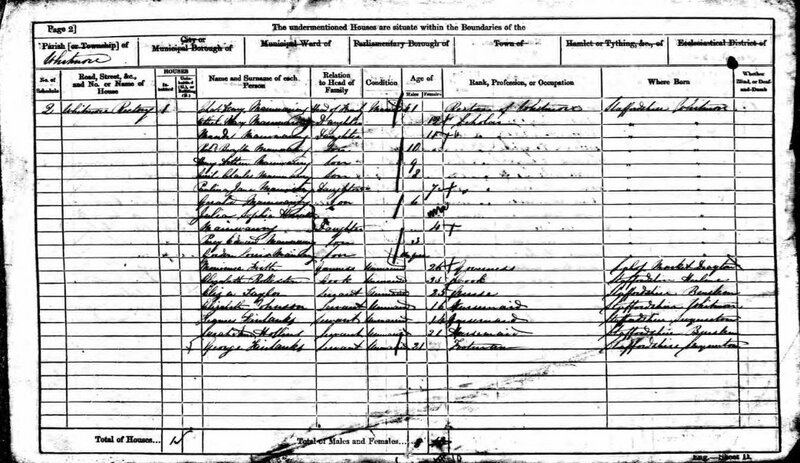 The sixth son Gordon Louis Mainwaring (1860 – 1901) was on the 1881 census an articled clerk (law) living in lodgings in Nantwich. In 1891 he was living with two of his sisters at Clifton Cross, Derbyshire, and was of independent means. As mentioned above, Gerald was in Manitoba farming from the mid 1870s. 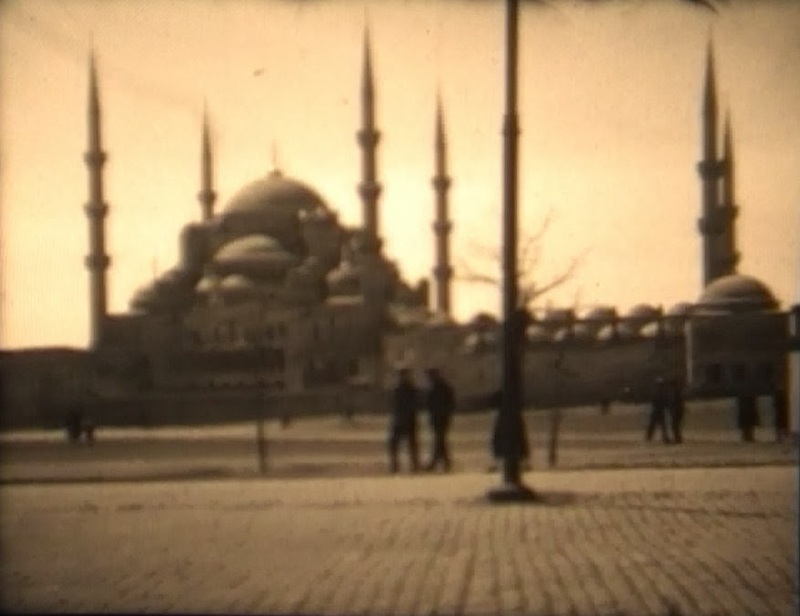 He returned to England in April 1879 to attend his sister Julia’s wedding. 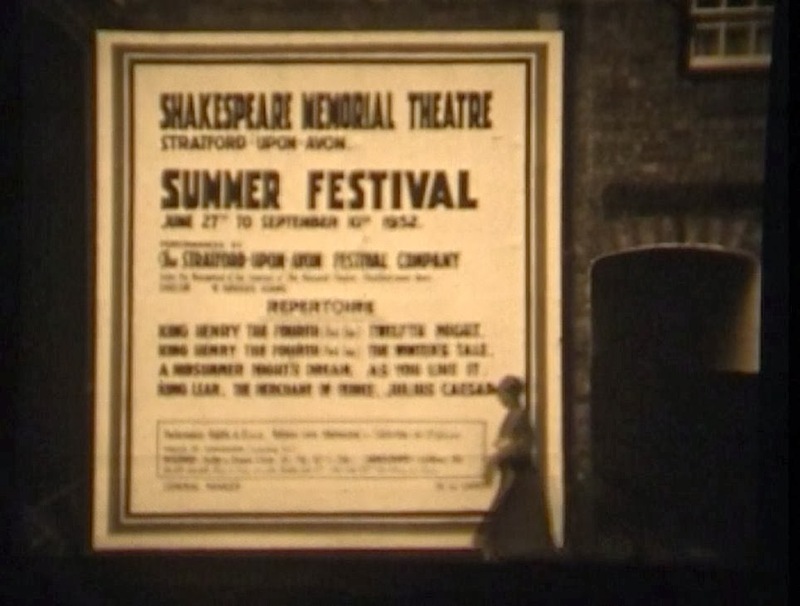 In July he was due to return to Canada but before doing so decided to go on a spree in Derby. He became very drunk, was apprehended by the police when driving a trap very fast through the town. He was apprehended by the police together with a female companion. When the police were searching the female companion, Gerald Mainwaring fired several shots with a revolver he was carrying; he wounded two policemen, one of them fatally. Gerald Mainwaring was tried and was found guilty of murder. He was sentenced to hang. However, his sentence was commuted to penal servitude for life as it turned out that the jury had not been able to agree the sentence and effectively drew a ballot to decide. 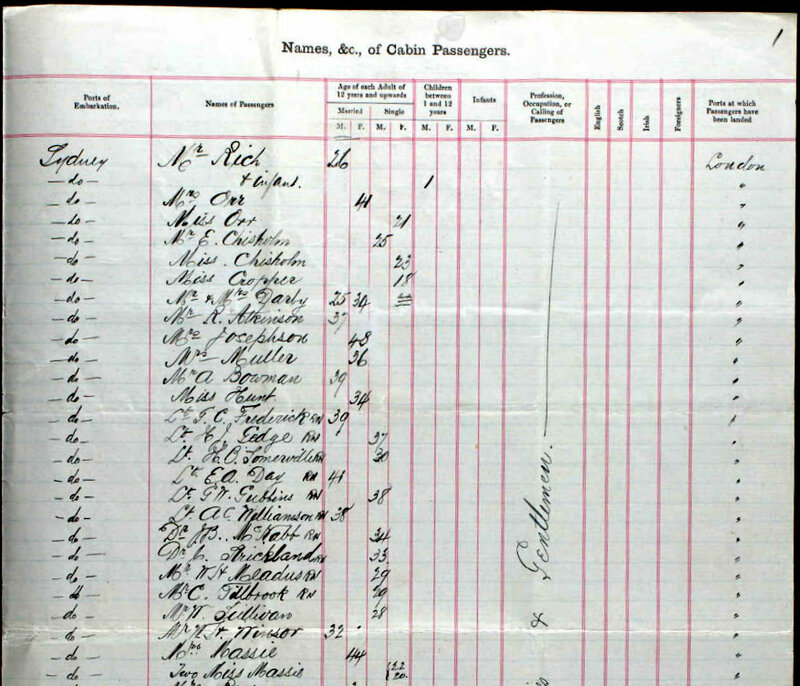 On the 1881 and 1891 censuses Gerald Mainwaring was recorded as a prisoner at Her Majesty’s Prison at Chatham Kent. The prison closed in the 1890s. I can find no record of Gerald Mainwaring on the 1901 census or in the death records. Nor is there any newspaper mention of him. 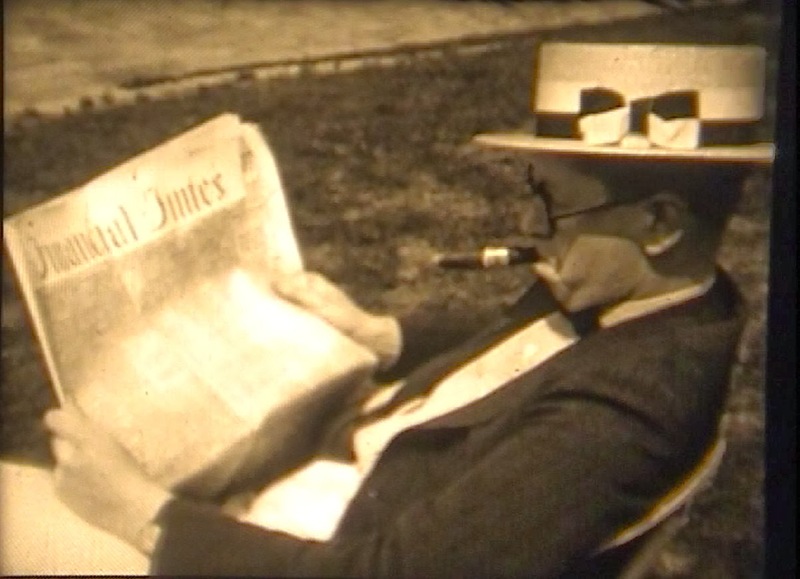 The family history compiled in the 1930s states he died in America and does not specify a death date. Gerald Mainwaring was my 1st cousin four times removed.